Want to create eye-catching newsletters that grab the reader’s attention? A well-designed email stands out in the inbox and drives results in the form of clicks and conversions. Would you like to send out newsletters that look appealing and inspire your recipients at the same time? A visually creative newsletter captivates the reader – making them even more likely to click through your email. What’s more, an impressive design can help to boost conversion rates. With HTML, email design knows no limits. With our HTML email templates, you can easily create professional newsletters – with as many images, links and text blocks as you like. A good newsletter tool should also offer advanced formatting and personalization options. We’ve compiled everything you need to know about effective newsletter design – including ideas, inspiration and useful tips. Every single newsletter should link to its web version, preferably at the top of the email where it’s most visible. If your images don’t load, this link enables the user to access your newsletter in their browser. While some email clients may block all images, web versions can usually be displayed without issue. Once the newsletter loads, your recipients should be able to easily identify who sent the newsletter. A recognizable company logo instantly inspires trust. Moreover, it helps to be remembered by your contact base. A compelling thumbnail is a necessity when it comes to newsletter design. It can determine whether the user reads the email or deletes it. A good picture says more than a thousand words. Make sure to use a high-resolution image that fits in with the overall newsletter context. If you want to add a caption, keep it short. It’s also important to consider the format of your newsletter. This includes picture, link and text placement. The content should be user-friendly, broken down into neat columns and meaningful images. Your font choice should be consistent, and allow for sufficient spacing. Increasing your following is something you should always keep in mind. Here’s one of the key newsletter design tips: you should insert social media buttons into the layout and link to social media profiles. This way, you can direct your newsletter subscribers to your social media profiles for even more customer engagement. Each newsletter should contain your company contact details. Don’t paste a link to a contact us page, but insert the sender name and address, as well as a valid phone number and email address. Every single contact on your email list has the right to unsubscribe from your newsletter at any given time. This is not just a crucial part of your email design: it’s a legal requirement. Therefore, you must add an unsubscribe link to every newsletter. After the reader clicks the unsubscribe link, they should be unsubscribed immediately. If you are sending several newsletters, you can also add a newsletter preferences link as well. This allows people to choose which newsletters they want to receive. A good email campaign inspires the recipient to take a certain action. Most of the time, it aims to encourage the reader to sign up or make a purchase. The entire newsletter design should be geared towards the action the reader is supposed to take. This is known as conversion-centered design – and that’s exactly what you should aim for. Essentially, you need to design your email in such a way that the reader is drawn to the call-to-action buttons. Once the reader sees a visual cue, there’s a higher chance they’ll complete the action. Another newsletter design tip is to place all the most important content above the fold (also referred to as above the scroll). This is the section of the email that the reader notices first when the newsletter loads. Therefore, it must be clear right from the start what the newsletter is all about and what action the recipient is required to take. This is where you should insert a fitting picture. Encourage the reader to continue scrolling down. Make sure to leave enough space between individual newsletter elements. Proper use of white space makes for a clearer newsletter format, and a better user experience. A crucial design factor? Responsive email design. Your contact base probably uses a variety of devices to read your newsletter: desktop computers, laptops, smartphones, tablets and even smartwatches. Your newsletter should look great on every device. With a reliable newsletter software, creating mobile-ready emails is not an issue. Responsive email design ensures your newsletter will display correctly. With Newsletter2Go, you also have access to dozens of free online newsletter templates – which we’ve display-tested in all the most important email clients. Images should naturally be of the highest quality. However, you should also be wary of the file size. Your contacts should be able to load images quickly – otherwise, they will lose interest. Consider that the file size isn’t equal to the displayed image size, but rather, the original upload size. Therefore, you should reduce the picture size before you start the upload. This way, you can avoid a slow loading time or load failure if your contact has limited bandwidth. Even if you use a responsive email template, it is still possible to encounter some minor display issues when it comes to images. Sometimes images just won’t load. Even if you’ve put all your effort into coming up with the best newsletter design, the effect of the images will be lost. This is why you should always take advantage of alt texts. If an image doesn’t load, the user will see this text instead. This helps to describe the image and put it into context. You can also embed buttons. Embedded images are always displayed, even if uploaded images don’t load. 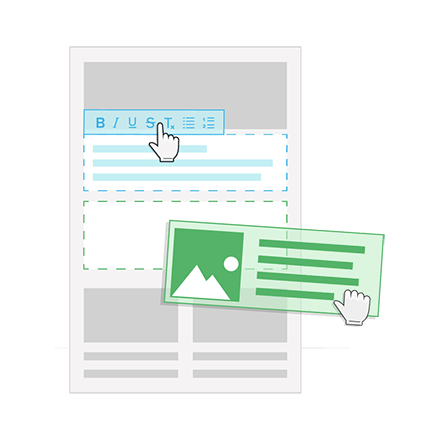 However, it’s important to note that embedded images can slow down the newsletter load time considerably – so you should only use this option when really necessary. If you aim to sell products with your newsletter, you will most likely want to insert product images. These should be appealing, fit well into the newsletter and catch the reader’s eye. Unfortunately, inserting the best images and having to reformat the newsletter can prove time consuming. Luckily, you don’t need to worry about it anymore. You can use our 1-click product transfer feature that comes with our software. This enables you to transfer product images from your online shop, straight to your newsletter – in just one click! The right call to action – or CTA – may ultimately determine your campaign’s success. Use active language which encourages the reader to take action. Some classic examples include: “view product”, “buy now” or “redeem discount code”. In addition to the words on your CTA button, pay attention to color and position. It should be clearly visible – ideally above the fold – and should stand out from the rest of the newsletter content. The more specific the CTA, the clearer it is for the reader. Think carefully about your choice of color. From a branding perspective, it is best to stick to your corporate colors. CTAs, on the other hand, should be bright and well visible. What’s more, it’s interesting to note that different colors conjure up different associations: yellow is linked to optimism, while red is more energetic but may also be perceived as aggressive. Cooler colors such as blue and green can have a soothing, refreshing effect. Black is often associated with luxury. Playing with contrast is another great way to make your newsletter easier on the eye. It will not only render your CTAs more visible, but it is a nice way to divide up the different elements of your email. This way, the reader’s eye travels naturally to each different section without having to look too hard. For some more inspiration, take a look at our favorite newsletter examples. Need more design inspiration? 7 actionable tips to make sure your emails look great and speak for your brand. [Read blog post]. Happy with your design but stuck for content? 5 unique content ideas to help you make an impact in the inbox. [Read blog post].